MotoAmerica is the official FIM/AMA sanctioned roadracing series in North America. 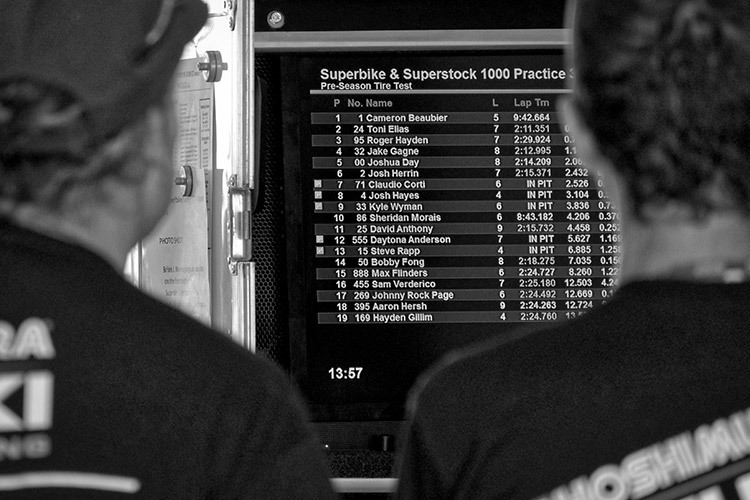 It is both the highest level of competition and exceptionally accessible series to race teams, media and fans. 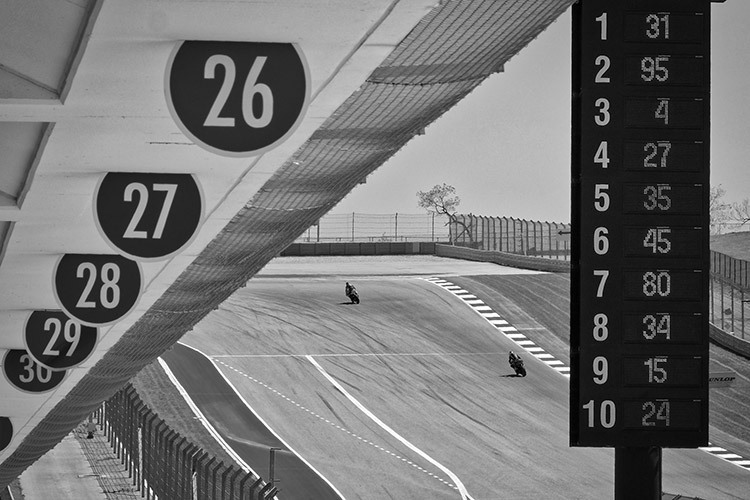 In March 2016 I attended preseason test days conducted by MotoAmerica at the Circuit of the Americas (COTA in Austin, Texas). Entry for the two days was free (!) to fans. The MotoAmerica management team was in the paddock area and freely approachable, and teams open to being photographed. 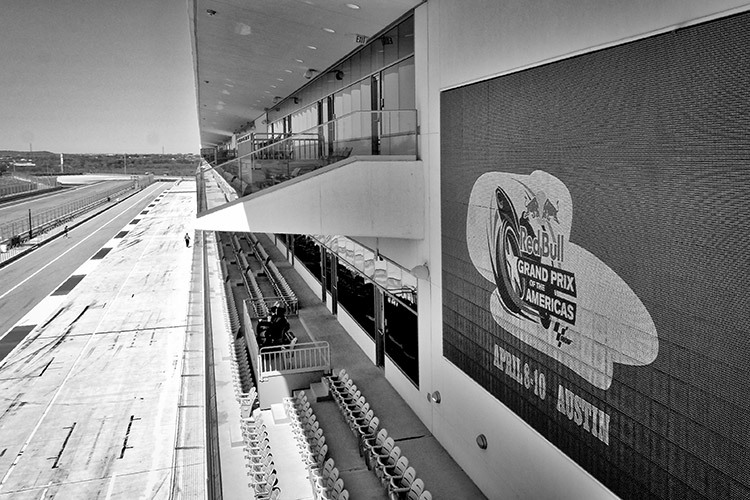 The COTA management permitted fans to roam the paddock and main grandstands (with the supervision of numerous but fan-friendly security staff). It was one of the most photography-friendly professional events I have ever attended. The agenda for a preseason test can be overwhelming. Teams are testing new machines conforming to new technical regulations, new tires, and in many cases new riders and crew members. Team Rabid Transit make quick changes to multiple settings on a new Yamaha YZF-R1 so newly-signed South African rider Sheridan Morais can test as many variations as possible in each 50-minute test session. 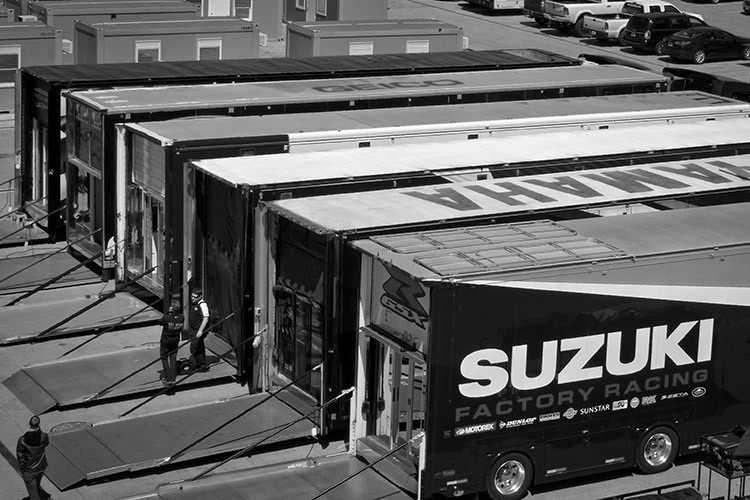 MotoAmerica test days begin with technical inspection at 7:00 a.m. and wrap up in early evening - a 12-hour day in most cases. While the goal is to make bike and rider the fastest combination possible, the rider will get just four 50-minute sessions on track. For the remaining nine or so hours, the bike will be tweaked, taken apart, checked, put back together - and stared at - in search of more quickness. 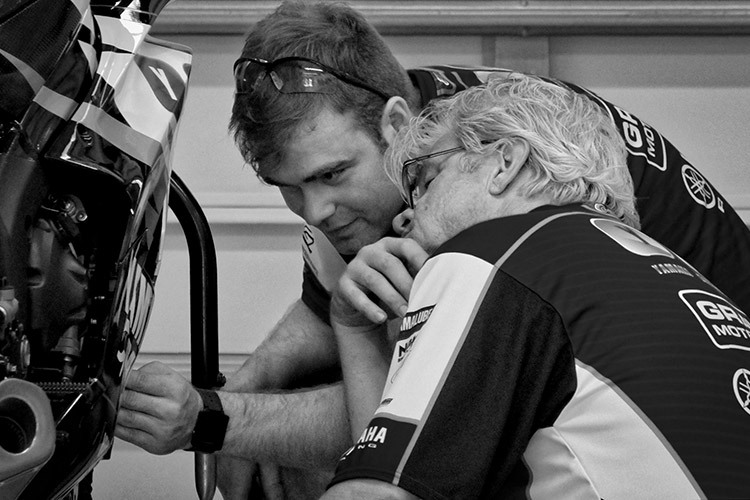 Access to areas directly above the team garages provided some nice perspectives to capture candid moments. 2015 Superstock 1000 champion Jake Gagne (racing in the 2016 Superbike class for Broaster Chicken/ RoadRace Factory) autographs a helmet for a fan who has been happily collecting rider signatures up and down the paddock all day. Testing is an unnatural, lonely state for racers accustomed to close quarters, nose-to-tail combat. Racing at the national level requires a lot of stuff. Semis full of stuff. 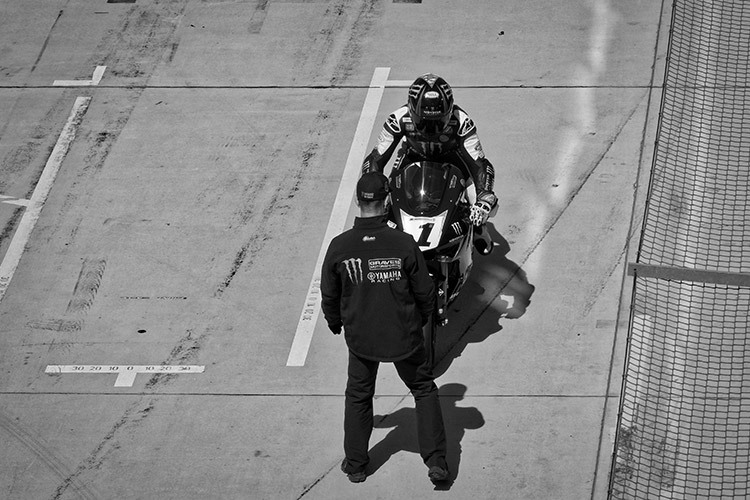 2015 MotoAmerica Superbike champion, Cameron Beaubier pulls in to hand off his MonsterEnergy/Graves Yamaha YZF-R1 to be moved into the garage for the next round of set-up changes. The lower deck of the COTA grandstands is cantilevered over the pit lane putting fans (and photographers) literally on top of the action. The official introduction of the Yoshimura Suzuki Factory Racing team, their Suzuki GSX-R1000 bikes in 2016 race livery, and riders Roger Hayden (left) and Tony Elias (right). Jonathan Green asks the tough questions for Speed City Broadcast. It was pleasant surprise to see new top-level riders from outside the Americas at this test. They included Italian Claudio Corti, who was European Superstock 600 Champion in 2005 and competed in several international series including Moto2 and MotoGP. 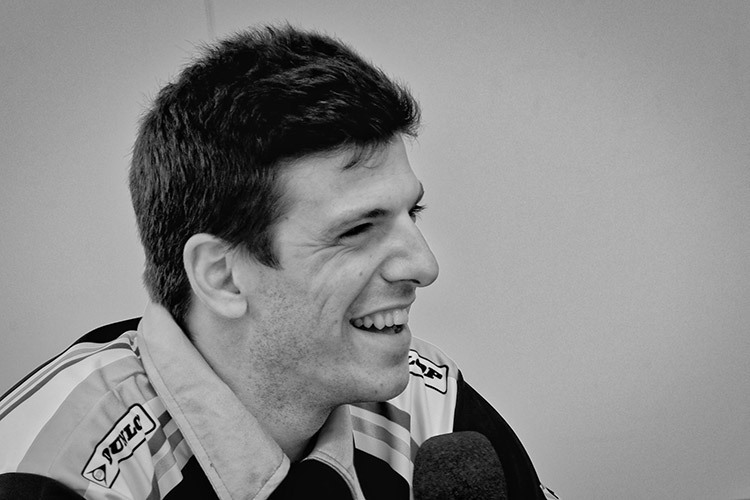 Claudio Corti expressed sentiments in this interview that he looked forward to racing in America where racing and rider talent still rises above the complex organizational and corporate priorities that dominate many international and European racing series. Catalonian Tony Elias (pictured above), the 2010 Moto2 World Champion appeared at this preseason test as substitute rider. He would stay with the Yoshimura team and win the first two MotoAmerica Superbike races during the April COTA series shared with MotoGP. Sheridan Morais (not pictured), a multi-time South African national champion is racing in the MotoAmerica Superstock 1000 class. Texas-size jumbo screens line both sides of the start-finish straightaway announcing the upcoming MotoGP races coming to COTA (note seating for size comparison) less than three weeks before my visit. The combined event included four days of practice and racing for the MotoAmerica series concurrent with the MotoGP classes. What a treat for fans! I was sorry to not to make it back for the actual race weekend.